I had intended to include bath images with the 'Boudoir in The Attic' entry but I could not photograph this room well. It's one of those situations where you think if you take a break that somehow you'll acquire skills and be a master when you return to the task. Well, it's painfully evident that the break was, again, not very helpful for me. I cannot get this bathroom to photograph well. There's a lot of Plexi in the walk-in shower which reflects light or is completely invisible when you try to capture it in a photograph. The vanity sink is made from a vintage Kitty Puppenmobel cabinet, a Re-ment platter and a miniature wind chime that serves as a modern faucet. 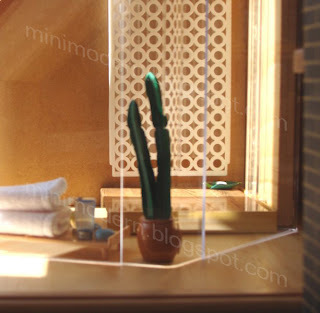 The walk-in shower is a picture frame, parts from a Buffy The Vampire Slayer action figure set and another miniature wind chime. The chair is from Reac Japan. The accessories are from AG Minis, Re-Ment, Mattel, Irwin and Jazwares. Can you help me where to by such fine 50-60 furnitures as you find, as I would like to give my daughter a beautifull house with fantastic furnitures :) And PS have you seen the Danish version - on designoff.dk? 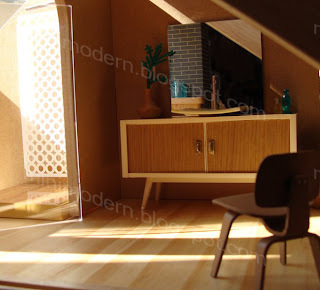 The 1950 and 1960 furniture that I have come primarily from eBay auctions and some browsing of independent dollhouse retailers in my local area. The majority of the chairs I have come from Reac Japan. You can find a link on the right frame for the chairs "Reac Design Interior Chairs". Another and more expensive option would be to have someone create the furniture for you ala Peter Tucker (link on right frame), etc. I wish there were current manufacturers of this period where Danish modern design was a major influence but so far no one is listening to the masses. Please do let me know how the house turns out. Maybe there's some way you could simulate steam on the plexi to make it more visible and photogenic: translucent film, smoke (p.u. ), miniature grubby fingerprints? Yeah, I'm stretching for ideas. I should probably get a photographer friend to take the pics. I wonder if I could use real steam without ruining the mini set-up...hmm. A cool idea that may show up in this blog someday. Thanks Uyek! I've heard of pro photographers using hairspray to minimise reflections, but getting it off afterwards would be the problem. However, putting something removeable on the pexiglas to reduce glare is probably the way to go. I have just found your blog while searching Google - now off to enjoy some of the earlier posts! Terrific work!